A typical salt box style house built in 1926. This was a common style construction for the 1920`s. It is located at Photographers Lookout as you enter Norris Point and has been there since it was donated and moved to this location in 1995 overlooking the beautiful Tableland Mountains. 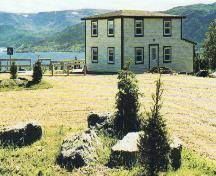 The main items on display are domestic artefacts typically found in and around homes in the Norris Point area in the past. There are also artefacts and paper documents on display that relate to the Jenniex family in Norris Point. There is a focus on the pulp and paper mill industry in the area (logging, etc.). Cod and lobster fishery artefacts are also on display. The Jenniex House has a Tea Room, a Craft Shop and Museum.